Wheat although second to maize in total production as a cereal crop, is the most important food grain in the world. It is a staple food for millions of people around the world and has been for thousands of years. The market for wheat benefits from the fact that wheat can thrive in many different climates making production relatively easy. Additionally it can be harvested in a short period of time. While such a ready supply would appear to be a detriment to price, in fact demand is believed to be increasing higher due to the growth in population. More than 550 million tonnes of wheat are consumed globally each year with the EU, the U.S., India and Russia being the major consumers. Approximately two-thirds of all wheat produced is used as food for people. The remaining is used as animal feed and some industrial applications. Massive droughts or floods can affect the supply of wheat and hence the price. Changes in import policy will have an affect as well as new agricultural technologies which can reduce production costs depending on the method of harvest. 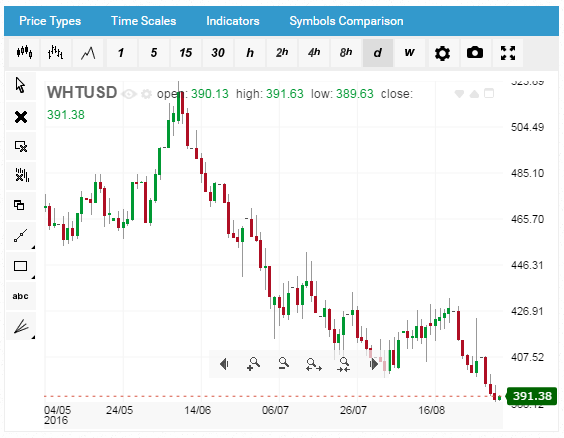 Additionally traders should be aware of factors affecting competing commodities such as corn or rice as changes in demand or price for these can affect the wheat price. Trading hours: Wheat trades daily Monday to Friday from 01:00 GMT and closes at 19:10 GMT. There is a daily break between 13:40 to 14:30. Spreads are usually higher during out-of-business hours. For more information on Wheat and other related trading products, go to our blog website, forex.info.